I recently took the plunge and picked up a 500GB Samsung 960 Evo drive to use as a Cache/Scratch disk for After Effects, Premiere, and just general “content in work” stuff. I’m still using my 850 Pro as my main boot drive and for applications, but the 960 Evo will have the bulk of my working files, video files, project files, and other media. 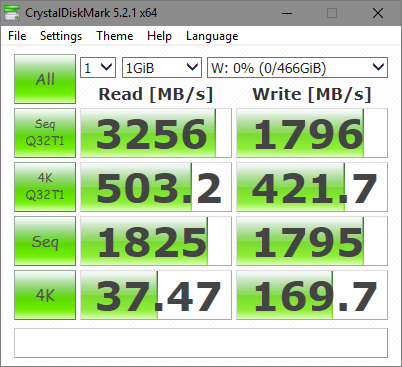 The main reason I’m keeping the 850 as the main drive is the longer warranty, better failure threshold, and size. Once the 960 Pro drives come down in price, I may upgrade to one, but that probably wont be for a while. I have the 960 Evo installed via the on board M.2 port on my x99 Deluxe motherboard, and that was a quick and simple install. The performance of the drive is amazing for benchmarks, but that’s not really what it’s all about here. The 960 Evo has been a nice little bump in “feel” for working with large (50MB+) picture files and video files. This isn’t like the change it was going from spinning rust hard drives to an SSD, but it’s still a nice little speed bump for a lot of applications. Also scrubbing though footage in Premiere and in After Effects seems a bit smoother. That could be simply due to splitting things to another disk, but, I’m happy with the upgrade. As you can see from the table above, the benchmarks of the 960 Evo are pretty outstanding in comparison to the 850. It doesn’t translate to that wild of a real world performance improvement, but it is definitely a NICE SSD and as prices come down it’s going to get even more worth while to upgrade. Bottom line, for a new system now, definitely try and get an NVMe SSD, if it’s in your budget. If not, a good old SATA SSD will still get the job done, and work well, but for every ounce of performance, the NVMe drives are where it’s at!